A short-cuff version of the SG3 MK II, the Scorpion SGS MK II Gloves offer up track day protection without the cumbersome gauntlet style. You can ride hard knowing that your hands are wrapped in goat skin leather, carbon fiber reinforced TPU knuckle protection, Knox SPS palm sliders and hard TPU finger protectors. Comfortable yet designed for maximum protection, the SGS MKII Gloves are the short-cuff sport solution for riders that need pro-performance at a less than premium price. Very nice and robust glove. I have some heavy-duty gloves for the track, but I was looking for something lighter for commuting and still feel protected. This glove is exactly like that: not as bulky as a track-day glove, but not too light to the point of making you feel unprotected. And the touchscreen feature is great! Of course it is not precise enough to allow you to text with it, but if you are riding, you are not supposed to be texting anyway, right? It is precise enough to get rid of “low battery” messages on your cellphone while you are using a GPS, for example. That’s exactly what I was looking for. I wear these daily. They are super comfortable and true to size. I went down with them once and the sliders did their job perfect. The constructiom is amazing. I can't find anything wrong with them. Decent protection, good quality, comfortable fit, and a great look. I think these gloves serve their purpose with enough extra features and quality to make these a really good buy. The ability to use my touchscreen with these gloves is sketchy, but good enough to get by in a pinch. I do almost everything by voice on my phone, so I can let that weakness go. 10" Circumference large hand and 3XL fits ok. Fingers are just long enough. Left pinky seems to chafe me so I put a surgical glove finger on my pinky til it loosens up. Hope they loosen up a little. I really like these gloves so far for cool weather short gloves. The placement of protection on pinky and thumb makes sense. Not tested luckily. Its odd that some say its way too big and some too small. I bought these local and they seem uniform between L and R hands. I got the red style. Comfie on the bike and no issues with controls at all. If they last I recommend them as a light summer protective glove with no wrist coverage. i ordered many pairs of gloves, but this is my favorite. i like the style, streamline and fashionable. i had to order 3 pairs to get the right sizing ( through different vendors). i usually would get a large, but the medium is the right fit. it feels quite tight, but in reading other review, the leather stretches in time and the finger length is just right, however the pinkie needs more flexibility. the key to this glove is the mini-slide pucks which is the key to prevent breaking your wrist. my #1 choice! efficient without the bulk! Bought the first generation and they held up well enough I got a 2nd set. Lasted 17k miles, I didn’t 100% need a replacement but the stitching around a palm slider started to come undone. You can’t find palm sliders in any other glove close to this price range. They feel durable enough tho I wish the palms were a littlebit thicker, I wouldn’t mind paying a bit more if they had a bit more beef to them. But your most likely to land on the palm of your hands then drag your knuckles so those sliders are a good selling point. They replaced the finger protectors with tpu injected plastics which is better than the super fabric that scratched everything so another improvement. I would buy these other more expensive gloves any day. Revzilla prices and service great as always with fast free delivery. I would recommend these gloves for the protective features. The gloves seem to be really well built even though I did not get a chance to actually use them for any riding. The problem I had was that the left hand glove was smaller than the right hand glove even though both were labeled as XL. The left hand glove was shorter in the palm and much tighter fitting in the thumb and pinky areas. Visual side by side inspection of the gloves also showed difference in size in these areas. Obviously a quality control oversight with Scorpion. The reviews I submitted were based on the right hand glove which did fit my 9 inch circumference hand well. I will be returning them and maybe try ordering another pair. I just don't want to keep paying return shipping costs. I have had these gloves for about 2 years, but did not ride much last year. In probably the 50 or so times I have ridden with them, they stitching has come undone on a couple of the fingers. When I first initially got them, the glove fit good, except for the fingers, which seemed a little short to me. After riding enough with them, they have stretched some, but not to full comfortable mobility. Fairly disappointed by these gloves, but maybe I just got a bad set. With set I received, I wouldnt recommend them, but with a few tweaks, they could be good gloves. the look good and provide protection but..
All in all I have to strongly discourage anyone from buying these gloves. I have owned them for just under 2 months. I have never been down on my bike nor have I been in any sort of sketchy situations on my bike while wearing these gloves. These gloves are already falling apar. the stitching near the finger tips is coming out. I bought a pair of gloves for $30 last year that are in better shape than these. They look really cool and have protection in all the right places BUT will the protection be there when/if you go down. These gloves are poorly made. I've worn Scorpion brand gloves for years in addition to RevIt, Alpinestars. I like the fit, comfort, protection and value of the Scorpion brand. I bought these for the hot summer riding. they look sweet. the only thing is that they are a tad bulky which makes it a little harder to clutch wheelie. Features I wanted, high rating. Well made street/racing glove for a nice price. I felt the fingers were a bit to short for my middle finger though..Quality high, but felt they were a bit small, would probably have gone a size up from L to XL..
Lots of armor and protection features at a budget price from Scorpion. We'll see if quality holds up though. Replacement for my original SGS gloves that lasted two seasons. We'll see how these do, I was very happy with the originals, but just as Anthony said in the video, the kevlar stitching is too strong for the leather - they switched to non-kevlar for the new Mk II. These are top quality gloves for hand protection, and they look & function great. Wanted a nice pair of gloves with a lot of protection. Great fit and the protection is second to none! Love this glove! I needed some shortcuff's because my gauntlets just don't fit over the cuff of my one and only jacket that I have at the moment. I really bought these because of the protection they offer for a shortcuffed glove, and I'm super happy with them. I was looking for a very technical glove that was highly reviewed, sub 100.00, made with goat hide, and had iPhone compatibility . This was the glove! Tried on the previous model from a friend, need great hand protection for my job. 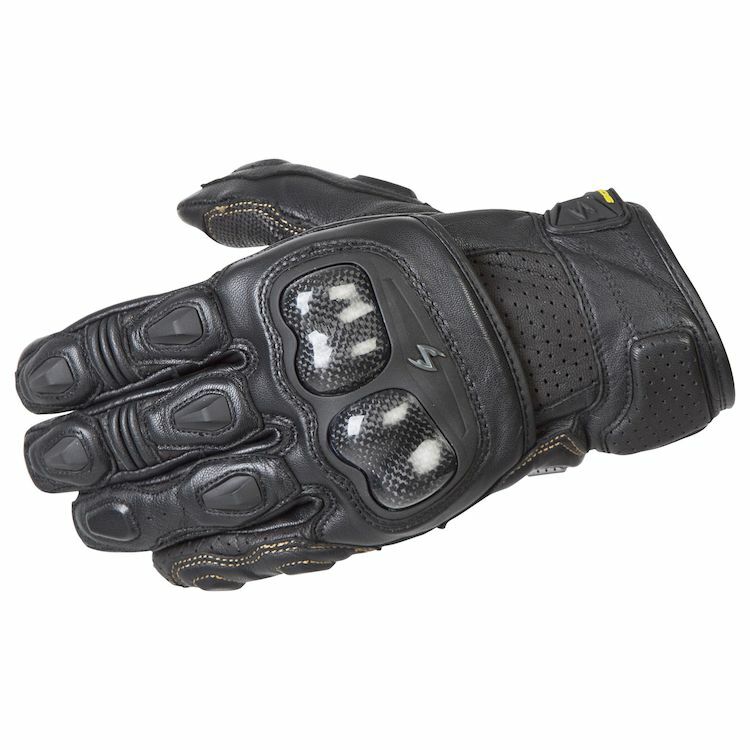 Love the way Scorpion products look and the Protection they offer..I also purchased a Scorpion Helmet and Scorpion Yosemite riding jacket along with these gloves. awesome review, love these gloves! I recently had the scorpion SGS gloves for a few years the gloves were great durable good movement and decided to upgrade to the SGS MK 11 gloves so far so good. This are overall decent gloves for the money, but deciding factor was "Touch screen compatible index finger". In this age we all use touch screen devices on our bikes. seemed like I'd like it and it turns out I love wearing them. I have purchased the previous generation of the SGS MK gloves and loved the comfort, protection, fit and overall durability of the glove. I used my first pair almost exclusively year round and for the price, you really are getting a lot of glove. I paid the exact same price for the first pair and used them for 3 years and counting. Good looks and they fit snug but not tight. My current gloves are also scorpion brand and i like them, just that i want some better more protective gloves. Good protection, good look, good utility. These looked to be a great replacement for the pair I recently lost. The costumer reviews as well as the video provided by the website, made me chose this product. A coworker recommended them and you. Looking for a good short cuff glove for summer riding. Price, features, and user comments. I really like the level of protection these gloves provide and the touch screen compatible index finger is a plus. My hand is 8 1/2 inch should i get large or XL? BEST ANSWER: Large. The leather will break in allowing a bit more room but personally I'd want them tighter than looser. I would get the Large. My hand is 9 1/2 and I went with the smaller size of XL. How will they do in hot weather riding? BEST ANSWER: For me, they fair great. They are perforated on the inside of the fingers so they allow my fingers breathe. I ride naked so my hands / gloves are exposed. For me, my hands will not be sweaty or anything like that. They are my favorite summer riding gloves to date. Have wore the Astars Valparaiso on a hot day and my hands were alittle sweaty due to waterproof lining which in bought them for and for cooler weather riding. So i need a summer riding glove i went with the SGS MK II based off price and video. In hot weather, they will do a lot better than you think. The part just below where the knuckles start is slightly open and lets in a lot of air. I've been riding with them in 90 degree (F) and haven't once thought that they were too hot. They do pretty well. When I drive in 95+ degree weather in stop-go traffic, I can get some sweaty hands. But any time on the highway, or when the traffic is clear they are fantastic. I don't know about hot hot weather, but I ride in 70-80 degree weather and they are just fine. Haven't had any problems with them not breathing enough. Had them on today it was 84F and they were pretty cool. The short wrist keeps it pretty cool. Even when stopped it was no issue. They're fine. I've been in 90+ temps, no problem. Do these gloves have internal or external stitching? BEST ANSWER: Both. The seams on the finger tips and along the front of the fingers is external, but on the back side of the fingers and in most other areas it is internal. both, fingers have internal stitching - these are awesome gloves, very comfortable. Is touch screen material just on the pointer finger or on the thumb too? BEST ANSWER: I just checked, the pointer finger is the only touch screen capable finger. None of the other fingers work. Do you need a gauntlet glove for street riding or will these do? BEST ANSWER: I Have these for street riding. Im a daily commuter on an 09gsxr750. Ultimately its personal choice for protection equipment. These gloves provide the most amount of protection in a short cuff glove that I have found. Your wrist is made up of very intricate connections between your Hand and the Ulna and Radius bones in your Arm. Gauntlet gloves ( better pairs like Scorpion SG3 Gloves $99.00 or Sedici Ultimo Gloves $79.00) will help hold your wrists from bending backwards so far it breaks. Short gloves with Sliders in the palm prevent Hand abrasions, and also because they will "skid or slide" on the asphalt and NOT stick or grab as other materials might the CHANCE % of breaking your wrist from putting your hands out are lessened. BUT do NOT be mislead - palm sliders alone will not prevent a broken wrist! A professional street gauntlet glove offers superior protection that's why and how they got invented. The only way to prevent a broken wrist is to stop it from extreme direct impact and/or prevent it from bending backwards too far. Gauntlet glove do that better - but dag, they're also hotter, more cumbersome, need to be tightened around wrist so jacket will fit over it. Or very loose so jacket fits over them. Hotter in the summer. If you really want to understand how to stop a broken wrist from sudden heavy impact look-up "rollerblading wrist protection gloves". I've been riding over 30 years, was a hooligan (750F, GS750, GSX-R750) and now not. I've broken bones and more. I own both and wear both at different times, but the short gloves are always high-end quality - I do recommend these short gloves. lots of choices, take your time and spend some money - the glove market you get what you pay for. look-up "Racer" gloves for the real deal. As I see someone else elaborated on, Its always a trade off so you pick if you want cool comfort or higher level of mostly cool protection. The Fly FL2 I bought are gauntlet and cool for summer with lots of apparent protections. If you are wearing a full jacket maybe the short gloves are enough. Shirt only I like a gauntlet. Fact is you dont need any gear at all to ride but it comes in handy if you ever have a get off or fighting off flying debris from a truck etc. I bought these for summer and always wear my full jacket. these are really good, durable, feels like something that will good for a while. i like them a lot. These will do. I like gauntlets for fall/winter riding. I have short fingers for my size will these gloves work me? BEST ANSWER: The fingers are barely long enough for my largish normal hand so I think shorter fingers should be perfect on this glove. I got 3XL with 10" circumference hand and fingers bottom out if I push them on fully. I have a 10 inch hand. What size should I get? BEST ANSWER: My hand is about 10" around and I got the 3XL and they fit ok and need to loosen up a little bit still. I always have to get bigger gloves so if your hand is somehow skinny but wide with short fingers maybe a smaller size may work.